On March 30th, actress Fujiwara Norika (39) handed a donation of 63 million yen (~$757,000 USD) to the Japanese Red Cross Foundation in Tokyo. The money she donated included her personal donation and the donations she collected through her charity, "Smile Please?Fujiwara Norika World Children Fund". The star also stood in front of the donation box after every showing of her recent musical, "Marguerite", encouraging the audience to donate for the disaster. 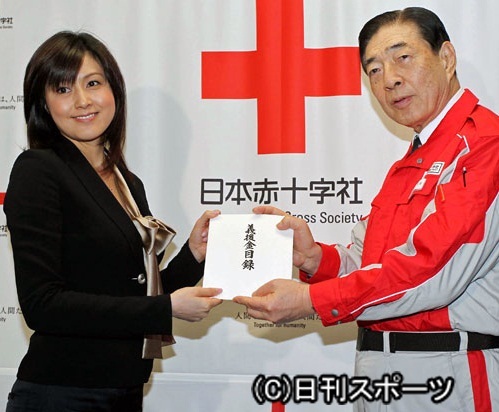 As a public image person for the Japanese Red Cross, Fujiwara also attended a meeting on disaster management. She commented that after hearing an explanation on ongoing relief efforts, "I became aware of the reality that the disaster victims and people involved with relief are all worn out mentally and physically. When my (musical's) Osaka performances end, I want to help at the disaster sites." AKB48 chosen to MC for "MTV VIDEO MUSIC AID JAPAN"